What is the goal of the race? Simply, to give runners the best race experience possible. If we do that, all else will fall into place. Are the 5K and half marathon certified courses? Yes, the 5K and half marathon races are held on USATF-certified courses. The process to certify a course under USATF guidelines is very rigorous and results in an extremely accurate race distance. USATF-certified courses are measured using Jones-Oerth devices while following the tangents on the road. Mobile GPS systems record the wearer’s position every 1–20 seconds, then “connect the dots” to estimate distance. They do not take into account changes in elevation, and they are affected by such factors as cloud cover, tall buildings, and tunnels, all of which can alter measurement. No runner in a given race will run precisely the same tangents that the course measurers have used, yet only that path covers the precise race distance. In a race with many hundreds of entrants, the great likelihood is that, due to the surrounding runners (and other variations, such as running to aid stations), a participant will travel farther than the official race distance, which is measured on the shortest possible course. We hope that this information helps to explain why many personal GPS course measurements do not perfectly match the official race distance. Are there any course changes in 2019? All events will start and end at Soldier’s Field Memorial Park. The half marathon course will be the same as the 2018 with no hills, a very fast and flat course, mostly on city trails. No, not in any of the races. Sorry the course cannot accommodate them and our insurance prohibits them in all the events. Temperatures on August 25th average a high of 77 F and a low of 58 F. However, SE Minnesota weather is known for its unpredictability so be prepared for anything! We haven't had any snow in the race's 33-year history. Will the race be cancelled for any reason? In our 33-year history of this event, we've never cancelled the race. It will be run rain or shine, unless there is an event such as an Act of God or the City of Rochester deems it unsafe. Under severe weather circumstances, if possible the race start may be delayed until the weather passes. Can I run both the 5K and Half Marathon? No, but you can run both the half marathon and a leg of the half marathon relay Each timing chip is programmed for only one race and your results will not be captured if you wear it for a second race or wear the wrong chip in the wrong race. There is free ramp parking and free meter parking after 5 pm weekdays and all day on weekends. You may also park in any of the Mayo Clinic employee parking lots as well as in the Kmart parking area. Is there a race hotel? Refer to the Visitors Tab on the www.healthyhumanrace.com website. Will bag check be available for this race? Yes in the start/finish line area at Soldiers Field. Bags used for bag check can be obtained at packet pick-up. No other bags can be used. Be sure your bag is labeled with your name and race #. You must show your number to retrieve your bag. Please do not place any fragile or valuable items in your drop bag. We cannot guarantee any of those items in your bag. The bags are left in the bag drop area at your own risk. Any items left unattended at the start/finish line will be donated to a local charity. What time is the last bus for the relay exchange point to transport to 20th ST SE? What is at each water stop? And how many are there? For the 5K, the one water stop will have water. For the half marathon, the water stops will have both water and Gatorade in easily distinguishable cups. The half marathon will have six water stops. Where are the bathrooms? And are there any out on the course? There will be porta potties at the start/finish area of the race and at the aid stations. No, when running on the roads, there may be light traffic. There will be course marshals along the way to guide you safely, as well as uniformed police officers to ensure your safety at critical intersections. The finish line along George Gibbs Drive in Soldiers Field will be closed to traffic. What type of schwag will I get? Each participant will receive a high quality technical t-shirt and a huge gorgeous very unique custom medal at the finish line, admission to the special post event race celebration with plenty of free recovery food and drink. Is the Finish Line area accessible to everyone? Yes. Please refrain from bringing bags or packages to the finish line area. However, the post-race food is only available to the event participants. What food will be at Post Race? And can family & friends join? Yes, food will be served at the post-race gathering to include, water, Gatorade, chocolate milk (half marathon only), bananas, chips, salted nut rolls, Reichels Snack Packs. Because of food quantities ordered for runners only, we ask that those who are not participating in the running events to please refrain from consuming the post-race refreshments for the runners. Please be respectful of that, and those finishing after you who also want and need the refreshments. This will ensure sufficient food for ALL participants. Your ticket for food will be your race bib. Do I need to stay for the awards ceremony? Can I pick up my friend's packet? What will I need to bring with me when I pick up my race packet? You will need to provide a valid ID and a copy of your race number confirmation. Typically, we do not need to see the confirmation unless there is an issue. This is never known until you pick up your packet and there is a problem with your registration (rare). Yes, or hop, skip, juggle, and dance your way to the finish. There will be a 4-hour limit for the half marathon. Many folks will alternate running/walking, some will walk the whole thing. We will have many, many course marshals, course directional arrows, and police officers along the course to make sure you do not get lost. Follow the directions of the course marshals and do not go where cones mark no entrance (usually at junctions). How can I identify a Healthy Human Race volunteer? The HHR volunteers will be wearing a highly visible volunteer t-shirt. All areas staffed by volunteers will have a responsible adult or person age 16 and above with a cellphone or a radio to contact emergency personnel at all times. Is there a headphones policy? Headphone use is allowed at your own risk. Please remove them or pause your music when you approach an officer or a course marshal to ensure that you can hear their directions. Runners come in all shapes and sizes. You'll be fine. What if I can't finish the race? There will be support vehicles and personnel on the course for any medical emergencies. Additionally flag down a course marshal or a volunteer at an aid station and we'll arrange for your safe passage back to Soldiers Field. What do I do before the race? Arrive about 30 minutes to an hour before the start. There will be lots of adrenaline flowing and it is an exciting atmosphere! If you have not picked up for race packet, you will do at this time. Please be sure to place the timing chip in the laces of your shoe and to pin the race bib to the FRONT of your shirt/shorts. Go potty. Runners love to go potty before races. The lines for the potties may be long. Why does the bib number need to go on the front? It needs to be visible as you approach the finish line, so the finish line officials know you are officially registered in the race. It also is helpful to race officials on the course. HHR will run both the half marathon solo, and half marathon relay at the same time on Saturday. The color of the bib indicates which event you are in. 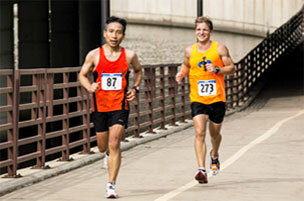 Additionally your race bib will help identify you for race photos. Are there other items that are not permitted on the course? For your safety and that of others, we do not permit the following items on the course: in addition to strollers, any wheeled conveyance to include inline skates, skateboards, bicycles, scooters. We also prohibit the accompaniment of animals with you. We highly recommend NOT using an iPod or musical device. Even if you can still hear everything around you, folks around you are less likely to talk to you and cheer for you if you are wearing a musical device. You will also need to know what race officials are saying, along the course, and at the finish. However, if you must wear a device that transmits music, please keep the volume at a low level that you can hear other runners on the course and most importantly are aware of your surroundings and course marshal/police office’s commands. I cannot run, so I would like to give my number to a friend. Is that OK? No, numbers are not transferable. Are there shuttles to the relay exchange and return to Soldiers Field? Free shuttle bus service is provided for runners from downtown Rochester (2nd Avenue SW, directly east of Zumbro Lutheran Church) to the Relay Exchange area is along 20th ST SE and back again. The bus will run continuously from 6:30 a.m. to 10:00 a.m. The bus will load and unload on 2nd Avenue SW, south of 6th Street SW, between Zumbro Lutheran Church and the backside of the Family YMCA. Please keep in mind, if you choose to drive to the Relay Exchange area parking is very limited. Note: the shuttle buses are for HHR participants only. Can my race registration be refunded? No. We are sorry, but the registration fee for the race is non-refundable. Cancellations: Race fees are nonrefundable and cannot be transferred to next year's race or another event. Sorry, no exceptions. Your registration can be transferred to another participant up to one week before race day. Registration transfers can be done through the online registration page once logged into Race Roster. There is a $10 transfer fee along with any event price difference. There will be no registration transfers after the deadline or on race day. Switch Distances: You can change your event distance up to one week before race day by visiting the online registration for this event. Once logged in you will have an option to switch distances. There is a $6.50 switching fee along with any event price differences. If you miss the deadline for switching distances, you can change your distance at packet pick up for a $15 fee. There will be no event switches on race day. Are dogs allowed on the course? Unfortunately, the course is only open to humans and our insurance prohibits them in the running races. If I am pre-registered, where may I pick up my race packet? May I register for a race during the packet pick-up? Yes, you may register for both the 5k and half marathon related events on both Thursday and Friday at HHR packet pick-up at Scheels. 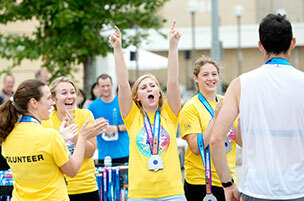 There will be no late registration on Saturday for the half marathon and 5K events. Will the 5K and half marathon accommodate wheelchairs or hand cyclists? Yes and the wheelers and hand cyclists will have their own start 10 minutes before the other start.If you are a wheeler or a hand cyclist, please notify the race director that you will be competeing to ensure that we are adequately accomidating your needs on the course and for pre and post race. Where can I meet up with my family and friends after the event? There is no reunion area designated, so we suggest you make arrangements with your friends and family prior to your race for a location to meet up with them. How do I know where to position myself at the start line? Runners are supposed to line up according to how they think they will finish - fast runners in the front, slow runners in the back, walkers behind the runners. This prevents congestion on the course. You want to be amongst runners who will be running the same pace as you. You don't want to be passed by swarms of folks, and you don't want to be dodging and weaving around people slower than you. Please be honest with your abilities and what you honestly think your pace will be. Sure, we would all like to think that we are far faster than we really are, but it is all about the journey. Out of respect for all participants, please place yourself in the area of your expected pace per mile. The Terraloco Pacers will be on the course to help you maintain your desired pace throughout the half marathon and maybe even get you to the finish line with a personal best. Look for the pacers in the starting line crowd holding signs high in the air with their pace. There will be some pre-race announcements, followed by the National Anthem. When will race results be posted and where? Why do the official results show me running slower than the time I recorded on my watch? The posted results list the official, or “gun” time of each participant. This is the time elapsed from the actual moment of the start of the entire race until an individual runner crosses the finish line. Net, or “chip” time is the time elapsed between that individual crossing the start and finish lines. For example, if it takes you one minute to cross the start line and you run the race in 45 minutes, your official time is 46 minutes and your net time is 45 minutes. When you look up your results, both times will be listed. How will the HHR 5K and half marathon events be timed? The 5K and half marathon are timed events using chip technology. You will be issued a chip at packet pick up that you must place on your left or right shoe with the zip lock provided in your chip envelop. You will need to return the chip shortly after crossing the finish line. Failure to return will result in a $30 loss fee. The chip will be activated when you cross the start line mats and stops timing when you cross the finish line mats. How will the half marathon relay be timed? Half marathoners will wear ankle chips. These chips are secured around the left or right ankle with a Velcro strap. The chip must be transferred from the 1st to the 2nd runner at the relay exchange point. Failure to do this will prevent the relay from obtaining a finishing time. These chips much be returned immediately after crossing the finish line as they are reusable chips. Failure to return will result in a $30 loss fee. Only the final runner will be timed. If the first runner desires their time, please use your chronograph timing device. I’m a very slow runner. Can I still run the race? Runners and walkers of all abilities are welcome. If you’re relatively slow, however, you should stay towards the right hand side of the course. Be sure not to stop suddenly or veer into the paths of other runners. If you’re running with friends, run no more than two abreast. Doing this will keep traffic on the course moving smoothly. I’m not able to run the race. Can I still get my T-shirt? Yes, you may still receive your t-shirt during packet pick-up, however t-shirts will not be mailed. What are the security measures? As part of our ongoing focus on your safety, and in partnership with Final Stretch, Scheels, and the Rochester Track Club, we ask for your full cooperation in order to avoid any interruption of the day’s events. There will be a bag check. It is preferred that you please secure bags in your vehicles or ask a friend/family member to hold onto your items until you finish. Hydration packs will be permitted in the start corral. Small pouches/belts will be permitted. Any bag left unattended in the area of the start, finish, or post-race refreshment area will be confiscated by security and could cause an interruption to the day's events. .